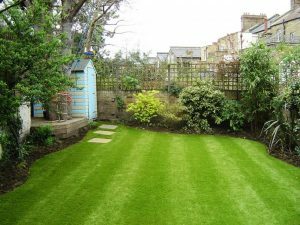 Touted as the lawns of the future, artificial grass for gardens is an immensely popular choice these days. It is available in varying lengths, hues and colours. Gone are the days when this grass was used only in the sports arenas and in the indoor playing fields. These days, fake grass made up of synthetic fibres can be seen everywhere in the patios, lawns and gardens. Those who want to maintain a green and gorgeous lawn but can hardly afford anytime for it, install synthetic grass in their garden. The grass simulates so closely to the natural grass that without touching the grass it is impossible to find out whether it is real or not. This grass needs no maintenance. You do not need to water, trim, and cut or mow it. All you need to do is to just clean the surroundings for falls. The biggest advantage of the synthetic turf is that it remains unaffected by the adverse weather conditions. However harsh the weather conditions may be you can expect them to remain green forever. This is the reason; they can be grown in the indoor areas over rugs also. They remain unaffected by UV rays of the sun. When grown over rugs or doormats, they can impress the visitors. Also, your kids and pets can play for hours over the fake garden and you do not need to worry about the muddy paws getting inside. In a way, they are eco-friendly because they do not need any pesticides, insecticides, manures and fertilizers. The only hassle that you may come across is the refill of the grass. If you choose to purchase the best quality turfs then you will get an extended warranty period, which means getting the best value for your money. The best artificial grass available in the market has a manufacturer warranty up to 10 years. So, you can expect to have a beautiful lush green garden that requires no maintenance, easy to install and remains green forever. If the area where you live has harsh weather conditions, you need to consider artificial grass that can prove to be a boon. They can grow them in indoor as well as in outdoor areas. For more information or to make an appointment, call us 01159 523 053 or 07817 920034 and email us info@lawnfrog.co.uk or visit our website www.lawnfrog.co.uk.